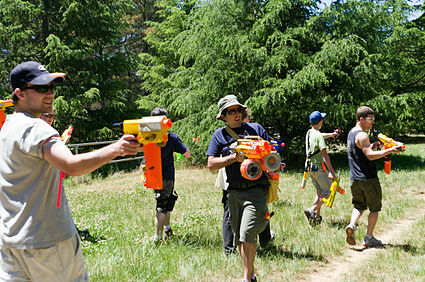 This sounds like a game for kids – but the big kids and even the grandparents can have great time playing Nerf War. Yes some of the weapons are quite expensive but you can get started with basic weapons and still have a great time. Safe for indoors or outdoors and girls have just as much fun as the boys. You can have teams and formal rules or just a free for all. For indoor games use rules such as – you cannot use any limb that is hit ….hilarious to watch armless zombies trying to avoid bullets or hopping mad one legged shooters. 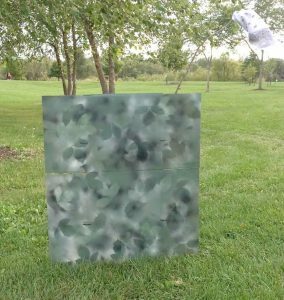 There are plenty of ideas on google such as this ladies great camouflage idea so simple using cardboard, some cheap spray paint and tree leaves. 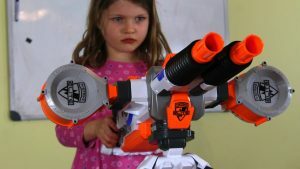 Warning – you will be picking up nerf bullets for months after. While it is basically very safe we recommend that players wear eye protection especially where more powerful guns are being used. You can pick up very inexpensive safety glasses eg: pack of 10 for $8 on ebay….after all they are only deflecting soft nerf bullets so they don’t need to be special. Hey There !! GREAT website.